Having a great sounding band is fantastic, but if you and your band aspire to take that step out of the garage and into the local pub circuit, there are a number of administrative tasks and strategies you must consider when marketing your band. The jump from jamming in the basement to performing for paying customers at a venue is an important step and many things are often overlooked in the initial excitement of a booking. Why invest in a marketing strategy? Drafting a marketing strategy will assist you in landing and promoting gigs as well as expanding your brand. It will also further establish your band and give venues, promoters, and festival management extra information when making their booking decisions. How many videos do they have? Over how many years have they been active? What other venues have the performed? What is the range of music they perform? Attract customers, and make them want to spend money: Move booze, buy food. Retain existing customers: Move booze, buy food. Make them want to come back again. If your band is assisting in the above efforts, you are on the right track. While it is important to rehearse and polish the product you produce as a band, bar management does not hold that criteria in nearly as high regard. Venues certainly do not look to pay premiums for bands that are "good." They want to be secure that they have hired a solid sounding band that will retain existing customers, while drawing new faces that will keep the cash registers ringing. Talent certainly helps, but it won’t move the booze itself. So what are effective tools to assist you and your band in connecting with bar management that can ultimately land you that dream gig? Before you can sell management on your band and brand of music, it is important to draft a marketing strategy. Chances are you may already be implementing many of these techniques, but it is important to take a step back and look at macro view of your project. Anything created for the band such as websites, business cards, posters, social media, and swag should strive to be as consistent as possible. By using a consistent theme you are able to build familiarity regardless of what platform you use. Your marketing strategy and social media presence ultimately may not be for popularity or fishing for "likes" but more so to establish to potential employers that you are indeed a serious gigging band. The hub and spoke is a classic marketing strategy used in countless business endeavors that is designed to have several separate initiatives all working towards a central goal. The principal goal being the core of your business. 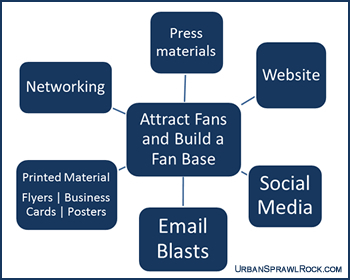 In this case, I’ve set the primary “hub” to: Attract Fans and Build a Fan Base. The primary goal can be anything, and most businesses probably would have “build sales” or something similar. For bands, the core goal could easily be a number of goals such as, land more gigs, get signed by a record label, or build a brand. Each spoke, while separate in nature are all connected and working towards a primary goal. If you are committed to developing a consistent brand, all the printed and digital aspects of these spokes will all have a similar theme, colors and consistent logo. Of course, many bands are literally on shoe string budgets, so it’s also important to utilize what you have. There is no harm in slowly building your brand over time. Approaching social networking with key words like "multiple platforms" and "strategy" can be challenging and it certainly not based in the spirt of Rock & Roll. Much of the core content of social media wasn’t supposed to be strategy based in the first place. Every time you post, be mindful of your social media goals. One major byproduct of the Hub and Spoke is it minimizes "one-off" campaigns and helps you focus on an interlinked strategy that uses a variety of different platforms to ultimately get you closer to the center and your primary goal. A "one-off" campaign is something that marketers can easily fall into and it is basically a campaign that starts and finishes a primary objective without considering any context of a larger plan or strategy. These types of campaigns can be effective; however they are also regarded as short sighted, time consuming and expensive. If you are going through the effort of marketing your band, it is a good idea to connect them. A "one-off" strategy is painfully easy to do. It could be a simple posting of a video in the wrong place. For example, on a whim, I posed a quick minute video of a live performance of our band on Facebook and shared it with a few Facebook dedicated groups that I thought might be interested in the video. The video took off and was viewed several thousand times. The issue? I hosted the video on my personal wall and not the band wall. So if any venue management happened to be poking around the band Facebook or YouTube page wouldn’t necessarily see that video. In that case, it was a fantastic "one off" campaign that didn’t really advance any of my primary goals. In retrospect, it may have been a missed oppotunity to promote the band. Though all of these spokes are probably worthy of an entire blog post, I will only touch on some basic points of each. The band website, like most businesses is crucial. It is the best marketing tool accessible 24 hours a day, seven days a week. While it does not have to be expertly designed or even very fancy, it should have some basic information about the band, contact information, links to band photos and video as well as where the band is performing next. Invest your resources in keeping the webpages up to date! It’s amateurish to force users to scroll down past months of outdated gigs to find where you are performing next. Remember keep an eye on your audience and make sure your pages are viewable on mobile devices. Another benefit to a website is your band or webmaster has direct control over the platform and content which is not the case with social media platforms. Social Media is a fantastic wonderland with endless marketing and promotion possibilities. Most social sites are free of change and give bands access to possible target audences. Yet, it can also be frustrating. With Facebook, Twitter, YouTube, Instagram, Four Square, Google+, Snapchat, and countless others, it can be hard to establish what to post where. You and your band probably only have so much time to invest, so picking the right platform to invest your time is critical. Facebook is probably the most popular social platform... right now. Bands and bars alike can broadcast events, happenings, and all sorts of other details. It’s also good for entertaining and nurturing your fan base. I try to avoid only posting about when and where we are performing next. I pepper our FB posts with light and amusing humor and comments about current events in music. One major pitfall with social media unlike a band website is you do not directly control the platform. Facebook is famous for always tinkering, so be mindful. Just because Facebook is the-end-all-be-all for social networking at the moment does not mean it will continue to be so. In a perfect world, it is best to keep a diverse set of platforms at your disposal. But that is the rub. I am sure most musicians do not have the time or desire to endlessly blog/post/promote their band. It helps reach out to your core fans and audiences to discover where they spend the most time and start with those platforms first. I get this question all the time on video: what is better for bands, pro or amatuer quality video? It is a bit of a loaded question and there is certainly no definitive answer. The easiest answer is post whatever you have available. It is however, important to look at your market. By posting and marketing a video, you are asking your fans and consumers to donate their most valuable resource: their time. We as a culture are inundated with hundreds of opportunities to watch video at home, work, on the phone. Why should we spend our time to watch your video? One strategy is to throw anything and everything at the wall and hope something sticks. Another strategy is to carefully craft and edit decent quality videos and release them over time. Either way, Youtube is the second most popular search engine in the world just behind Google. So whichever strategy you decide, you are helping expand your brand and digital footprint when you do upload. When you do release a new video make sure leverage all you can and reference it in all your social platforms and your next couple of email blasts. I will say from personal experience that whatever the video quality is, try to get the best sound you possibility can. Poor sound quality will turn users off fast. 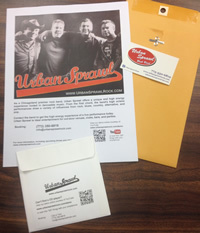 This is a common promotional tool that contains essential items regarding the band such as demo, bios, photos and contact information. A version of this is traditionally printed, but now most of this material is the core information on websites. Again, the importance of developing a consistent brand throughout your printed materials is important. Putting initial work into the press kit will provide content that you can promote through other avenues such as your website, and social platforms. In the golden era of Newspaper distribution, it was important to have a black and white publicity shot. As touring bands rolled into town, local papers could easily scan and publish upcoming events. Color photos just didn’t transfer well with standard newspaper ink. Just because your band is very active on social media doesn’t mean you can afford to spend less time on emails. Harvesting and nurturing email accounts is equally important in capturing your fans, especially those who are not active on social media. When sending bulk emails, be sure to BCC or Blind Carbon Copy your list so the end users are not forced to scroll through your list of contacts before getting to the meat of your intended message. Make sure to mention to your fan base that they can “unsubscribe” to your blasts at anytime. There are many resources that are free or cost little such as Mail Chimp and Constant Contact that can provide you tools to create professional looking blasts and are mobile friendly, but they may have restrictions or ways to upsell thier services. You don’t have to have a degree in art or access to fancy art programs to create an effective poster. Most standard word processing programs will work just fine. If you are not a computer whiz, try leveraging a family member or friend for help out. Standard size for rock shows is usually 11x17, but I’ve seen all sorts of shapes and sizes. 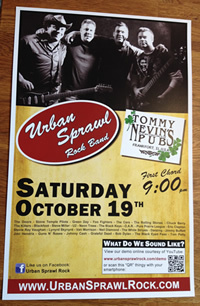 Name of the band, date and time of first chord are most important but it’s also a good idea to determine where the posters will be hung. If you plan to only hang them inside the establishment, then adding the venue’s information can become redundant or unnecessary. If you plan to use them as handouts or market them elsewhere, adding the venue’s address, phone and website is critical. Sometimes management will request that you to include their venue’s logo your flyer. You can always win confidence with bar management and ask them if there is anything in particular you can add to the poster on their behalf. If they have a food or drink special to promote, be happy to add it. If you are doing a poster over a month in advance, they may or may not have that information, but the small gesture on your part will re-enforce to management that you are committed to their core goals: filling the seats and moving product. As I have stated, I’m not an artwork whiz, but I have noticed particularly harder rock and heavy metal bands tend to gravitate towards black as the dominant background color for their flyers. Creatively, it may a good representation of that band, but not very practical when hung in bars and venues that are already darkened. Be mindful of where the actual flyers will be posted and stay away stylistic fonts or dark dominant colors. Harvesting relationships with promoters, bar management, and other musicians is critical. In this role you be part musician, politician and salesman. Your relationships with friends, family and fellow band members are equally important in discovering potential opportunities. They want you to succeed, but they don’t know how best to help. Instead of asking, “know any places we can perform?” Make it easy for them and give them a list of your dream venues. Do know anyone that works for , "______" and how can I get in touch with them regarding a possible booking? It helps to keep a spreadsheet of these contacts because they people in the restaurant/bar industry move around quite a bit. If a particular manager that knows your work moves to a new location, be sure to keep in touch if you can. Instead of a lost contact, it could lead to future opportunities. From the time you walk through the doors to when you pack up for the night, you are representing your band and your brand. As noted in greater detail in Advice for Playing in Bars, proper conduct, etiquette and face to face conversations with fans and management is critical in building your fan base and reputation. The more you perform, network and build relationships, you will be presented information that can assist you. Research other similar bands in your area. What are they doing that you are not? If you are performing at a venue, ask the wait staff and bartenders how the last night/week band was. They are in the trenches and can give some surprisingly honest and thoughtful insight. Once you have your Hub and Spoke marketing strategy in full motion, promoters, management, fans will have their pick of how they research you. The downside is there are just as many avenues for contacts to reach you! Email, Facebook, YouTube, chat boards, text messages all have personalized ways of connecting to you. Be sure to streamline all that information. Like in sales, it doesn’t matter how you prefer to communicate; It matters how your potential customer likes to do so. So be prepared to take initial contact from just about any platform.